In 1997 the Friends of Hollywood Reserve was incorporated and commenced work in the bush. 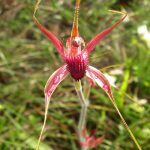 It was formed to save the land from Karrakatta cemetery – the horror of abolishing a lovely piece of bush to replace it with granite and sand galvanised people from far and wide to support the Friends group. Over the years we have weeded out mountains of lupins, lupins so high and thick that small children were able to lose themselves in them. We have battled numerous South African bulbs, and as the Reserve was originally a Dairy farm, the various planted foreign grasses. During World War II, the soldiers in the nearby Hollywood Hospital were told to go and cut down large trees as part of their ? therapy, rehabilitation. The felled trees lie there still. With lots of hard work we now have a very pretty park which we try to keep as native as possible. Each year we plant about 800 – 1000 plants. We have reserved an area for the local Hollywood Primary school, and each year they come in and help us plant about 500 plants. The real enthusiasm of the children is heartening. We wish we could enthuse some of their parents to assist us. Many students from the Universities have used the bush for their studies. We have a regular group of volunteers who turn out on the second sunday of the month to plant, weed, water, and pick up the rubbish from the cemetery, and do all the chores required to keep the bush viable. However, these volunteers are getting to an age where physical work is getting beyond them and we desperately look for new friends to assist with the work. We have a very happy group who work incredibly hard, but break off mid way during the morning for a social meeting with tea and eats. We are lucky to hold our morning tea in beautiful garden just across the road from the Reserve. The ashes of departed souls have been scattered to rest peacefully in the Reserve. We have a brochure boxes at two entrances and these contain the list of plants in flower for the month. Also a list of birds seen in the Reserve and a general information letter. Because of the fire earlier in the year, the Elephant Ear Orchid (Burnettia nigricans) flowered for the first time in our memory. 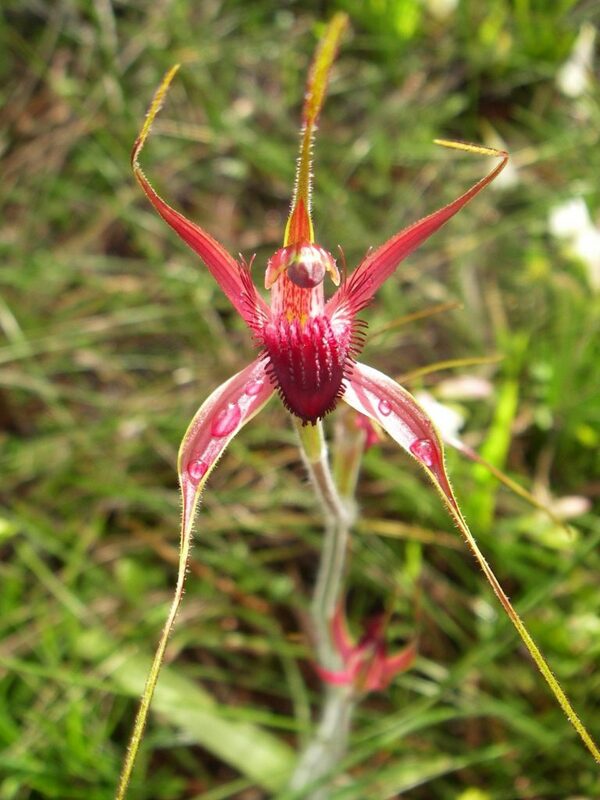 Also we found a Red Spider Orchid (Caladenia arenicola) Carousel Spider Orchid – not ever seen in the reserve before now.